3d Maori Girl - New Zealand Stamps, A 1935 Pictorial overview. 3d. Wahine, young Maori girl. Wearing a 'Pare' (head band) with a Huia feather and adorned around her neck is a 'Tiki'. 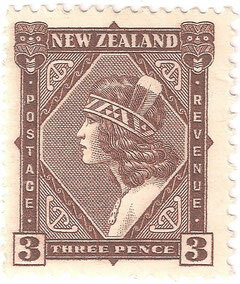 This was the only stamp in the set to be printed by photogravure. Design by L C Mitchell.